Does cannabis prohibition promote inequality in Canada? Alcohol and cannabis are widely used in Canada and abroad. In Canada, we allow alcohol consumption, possession and trafficking, while cannabis users, possessors, growers and traffickers are considered criminals. If alcohol is as harmful (or potentially more harmful) than cannabis, then clearly the prohibition of one and not the other is a form of inequality in Canada. Unlike alcohol, “an exhaustive search of the literature finds no deaths induced by marijuana.” Alcohol on the other hand can be fatal if consumed fast enough and at high enough quantities. Furthermore, alcohol is a major contributor to deaths in Canada, where it claimed 3892 lives in 2001. Globally, alcohol contributes substantially to the burden of death and disease (4% of total mortality and between 4% and 5% of disability-adjusted life-years), and thus is one of the largest avoidable risk factors. Despite these frightening statistics, moderate alcohol use can actually have health benefits such as a reduction in coronary heart disease risk. Despite some negative effects of cannabis use, such as short term memory impairment, it too has many health benefits, for example in the alleviation of symptoms of Parkinson’s disease. Considering there are positive and negative effects of using these two substances, and that the negative effects of alcohol seem to dwarf those of cannabis, than one must assume, that a society interested in pursuing equality and justice, would deal with these drugs in a equitable and fair manner. That isn’t the case in Canada. The federal legislation (Bill C-10) includes the following new measures: Mandatory minimum sentences for schedule II drugs (which includes cannabis). Trafficking: 1-2 years minimum. Possession for the purpose of trafficking: 1-2 years minimum. Importing/exporting 1 year minimum possession for the purpose of exporting: 1 year minimum. In 2007, 62, 510 drug charges involving cannabis were laid, which was more than half of total drug offences for that year. In 2011, police seized 1,845,734 plants. This heavy enforcement comes at no small cost to Canadian tax payers. The annual cost of enforcing marijuana laws (police and courts) is estimated to be $500 million. The irrationality of this is astounding considering the misuse of perfectly legal alcohol, which accounted for $7.52 billion of the $18.4 billion in damages caused by misused legal and illegal drugs in 1992. All illicit drugs, including cannabis, accounted for only $1.4 billion of this total cost to society. Arrests for cannabis, cocaine and other drugs. Many argue that cannabis prohibition is a just law because of its possible contribution to automobile accidents. While it is true that driving under the influence of cannabis is very dangerous, research shows that about three times as many people are caught driving after alcohol use than cannabis use. Also, alcohol is found in almost 5% more fatally injured drivers than all illicit drugs combined. Others argue that cannabis prohibition is appropriate because of negative side effects such as short term memory impairment. Even if it is true that marijuana has this effect, the same can also be said about alcohol. In a study at the University of Florida College of Medicine it was shown that alcohol has an extremely detrimental effect on short term memory and long term retention tasks. Some insist that cannabis prohibition is warranted because of its potential harm to various organs such as the lungs. Even if this were the case, there are many examples of internal organ damage induced by alcohol, possibly the most familiar being cirrhosis of the liver. In Canada, almost half of total cirrhosis rates among men are coded as alcoholic and the corresponding figure for women is one-third, which in a western European context is the average. This page has argued that marijuana prohibition is an urgent case of inequality that needs to be addressed in Canada. Marijuana and alcohol may be either therapeutic or detrimental to individuals (and society) depending on many factors. Even a preliminary scan of scholarly research reveals that alcohol causes much more societal damage in terms of physical health and economic cost than marijuana. Banning a less harmful (and more beneficial) substance, while allowing and celebrating a more harmful (and costly) substance is a serious flaw in our justice system. Inequality between alcohol users and cannabis users represents an institutional assault on rationality and compassion. 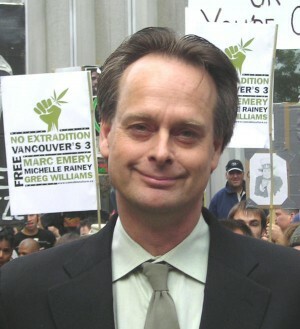 Activist Jodie Emery’s website has a wealth of information about the unjust nature of the war on drugs and in particular the incarceration of her husband Marc Emery. Potential benefits of alcohol: Eric B. Rimm, et al. “Moderate alcohol intake and lower risk of coronary heart disease: meta-analysis of effects on lipids and haemostatic factors” British Medical Journal, 319, 7224, (December. 1999) 1523–1528. Cannabis and Parkinson’s disease: Katerina Vendernova, et al.“Survey on cannabis use in Parkinson’s disease: Subjective improvement of motor symptoms” Movement Disorders. 19, 9, 1102–1106, September 2004. 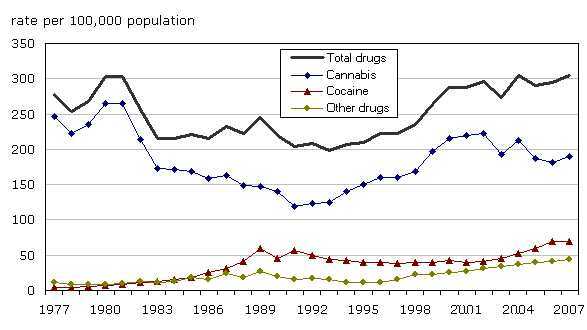 Drug related arrests: Mia Dauvergne, “Trends in police-reported drug offences in Canada” Juristat, 29, 2 (May 2009). Financial cost of the war on cannabis: “Facts and Figures: Marijuana in Canada” University of Ottawa. Economics of drugs in the early 1990s: Eric Single and Lynda Robson. “The economic costs of alcohol, tobacco and illicit drugs in Canada, 1992.” Addiction (1998) 93(7), 991-1006. Drugs and automobiles: “Impaired Driving in Canada”. Canadian Centre on Substance Abuse. 1-6. 2013. Alcohol and short-term memory: Don W. Walker and Bruce E. Hunter.“Short-term memory impairment following chronic alcohol consumption in rats” Neuropsychologia, 16, 5 p. 545. Alcohol and liver disease: M. Ramstedt. “Alcohol consumption and liver cirrhosis mortality with and without mention of alcohol—the case of Canada.” Addiction, 98: 1267–1276. (August 2003). ii . Jürgen Rehm, Jayadeep Patra,Svetlana Popova.“Alcohol-attributable mortality and potential years of life lost in Canada 2001: implications for prevention and policing.” Addiction, 101, (March, 2006) 373–384.